Casa Onis is divided into two spacious apartments. This apartment has a separate entrance and is located on the second floor. Here are the bedrooms, a spacious living room with open kitchen and a bathroom. The house has a beautiful communal garden with barbecue and garden furniture and has plenty of room to park. There is a beautiful view of the mountains. 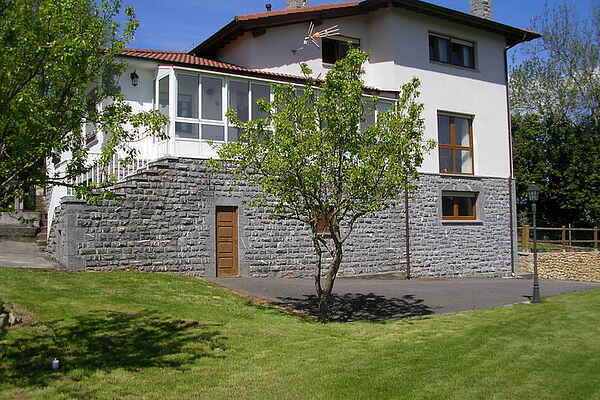 The house is ideally situated at the foot of the Picos de Europa, between the two main cities of the eastern Asturias, Cangas de Onis and Arriondas. It´s 15 km from the beautiful beaches of Ribadasella and Llanes and 10 km from the National Park Covadonga. It´s location is perfect for walking in the beautiful setting, surrounded by high mountain slopes and to do different sports like canoeing, rafting, hiking, quad biking, horse riding and cycling. Attractions: • Lagos de Covadonga. • Playas de Llanes. • Basilique de Covadonga. • Descente canoë sur la rivière Sella. • Pont romain, Cangas de Onis.